After our acoustic gig at Starbucks we are going back to our normal set up (voice and acoustic/electric guitar) at Club Fandango night @ Buffalo Bar. There are 3 more acts on the same bill. Hope see you there! 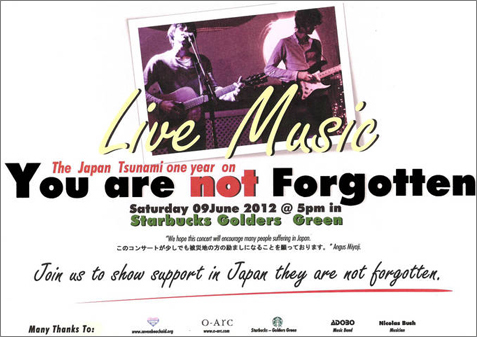 We are happy to announce that we will be playing a charity gig for “YOU ARE NOT FORGOTTEN“. This is in aid of the ongoing Japanese Tsunami relief work and Seven Beach Aid will be displaying photos from afflicted area. There will be 3 acts playing covers and original tunes. 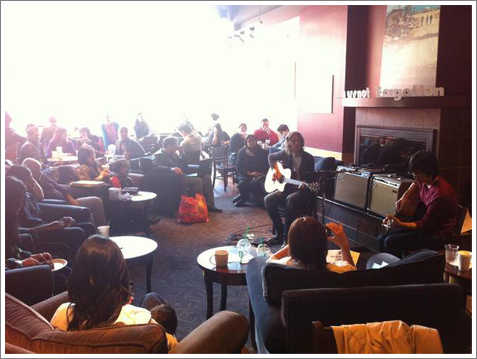 We have been re-working our songs for a special acoustic set. Hello GoodBye Show on podcast!! You can hear our live sessions & interview again! For anyone who missed Hello GoodBye Show on Resonance FM 104.4 on 25th February…..don’t worry！You can hear our live sessions and an interview again on their podcast! We played 2 live sessions (2 songs in each) from our first album “en” and we talked about how we met, the concept of the album, Neil’s second baby and much much more!! This is our last gig……. ?